I recently attended the Blogger’s NIght for the NBA Fit Air 21 Run. I’ve been out of the running scene for months now and I really wanted to reconnect with old running “chummy” friends. I miss the company, the laughter and I really, truly miss running. Race kit (Bib No and Timing chips) will be mailed to you. However, the NBA Fit-Air21 New Balance singlets can be claimed on August 4-6 at the NBA Fit Air 21 Activity/Event area at the Bonifacio Global City. Please bring your bibs & ID in claiming your singlets. 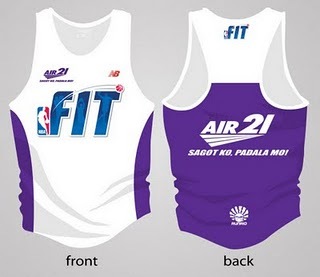 NBA Fit Air 21 Singlet Design --- Love it! Will there be any NBA personalities during the event? YES! Miami Heat Coach Erik Spoelstra, who happens to be half Pinoy, will be there! As Carlo Singson, NBA Fit’s Country Manager said, Erik is here to devote time and effort to their goal in creating awareness and addressing obesity in the country. I believe that this is NBA Fit’s main mission worldwide, to help people stay in shape, to beat obesity and to live an active and healthy life. And to answer the question if any NBA personalities appeared during the event…YES! Well, to make it clear, their AUTOGRAPHED Photos/Posters made it. Some of us even took them home. Lucky! 🙂 Will post photos soon! See you at the starting line as I start my ultramarathon (cramming) training!